You can read the most details on Transparent Labs STIM-FREE on our blog, where it's also named the best naturally-sweetened pre workout supplement! PreSeries STIM-FREE was developed to be the most exceptional "stimulant-free" pre-workout supplement available. With key ingredients like citrulline malate, beta-alanine, betaine, creatine, and taurine all included at clinically effective dosages, PreSeries STIM-FREE is highly recommended for anyone intolerant to stimulants/caffeine and are looking to "cycle off". With 100% formula transparency and the addition of Creatine HCl (3 grams per serving), PreSeries STIM-FREE is recommended for serious athletes and bodybuilders (men and women) who demand a high-intensity pre-workout experience. There's a reason why PreSeries STIM-FREE comes in a jumbo-sized jug! Each serving exceeds 23 grams per scoop (largest of the entire PreSeries) and includes 13 active ingredients designed to increase nitric oxide to the muscles, enhance focus and endurance, and gain lean muscle mass. From a performance standpoint, citrulline malate is the "star child" of pre-workout science. PreSeries STIM-FREE contains 6,000 mg (6 grams) of citrulline malate per serving. PreSeries STIM-FREE contains 2,000 mg (2 grams) of leucine per serving. PreSeries STIM-FREE contains 1,000 mg (1 grams) of isoleucine per serving. PreSeries STIM-FREE contains 1,000 mg (1 grams) of valine per serving. Creatine is found naturally in the body and is, far and away, the most researched molecules in the world of sports supplement science. Creatine has been proven to build lean muscle, improve strength and endurance, and increase the rate of muscle soreness [42, 43, 44]. "HCl" simply stands for "hydrochloride", which is a form of creatine bound with hydrochloric acid. This form of creatine is considered to be more water soluble than creatine monohydrate, which allows it to be absorbed easier into the body. PreSeries STIM-FREE contains 3,000 mg (3 grams) of Creatine HCl. Enhance phosphocreatine replenishment between sets when creatine is taken daily . Additionally, taurine used alongside BCAAs, has been found to reduce next-day muscle soreness more than when either are taken independently . PreSeries STIM-FREE contains 1,300 mg (1.3 grams) of Taurine per serving. N-acetyl L-tyrosine is the acetylated version of the amino acid L-tyrosine. The acetylation improves the absorption and effective period of L-tyrosine, as well as optimizes the effectiveness of the energy and focus ingredients in PreSeries STIM-FREE. PreSeries STIM-FREE contains 600 mg of N-acetyl L-tyrosine per serving. PreSeries STIM-FREE contains 500 mg of Choline Bitartrate per serving. Mucuna Pruriens has been found to bring both psychological and physical benefits to athletes. Psychologically, Mucuna Pruriens counteracts stress and provides a clean "peace-of-mind" feeling. Physically, Mucuna Pruriens decreases cortisol, promotes healthy testosterone levels in deficient men, and increase growth hormone levels [24, 25]. 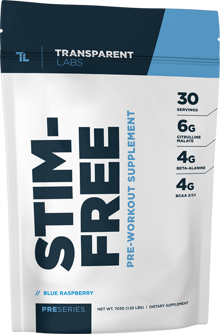 PreSeries STIM-FREE contains 70 mg of Mucuna Pruriens (98% L-Dopa) per serving. L-Norvaline directly reduces arginase activity in the body, which "up regulates" nitric oxide synthase's (NOS) ability to produce Nitric Oxide from arginine . 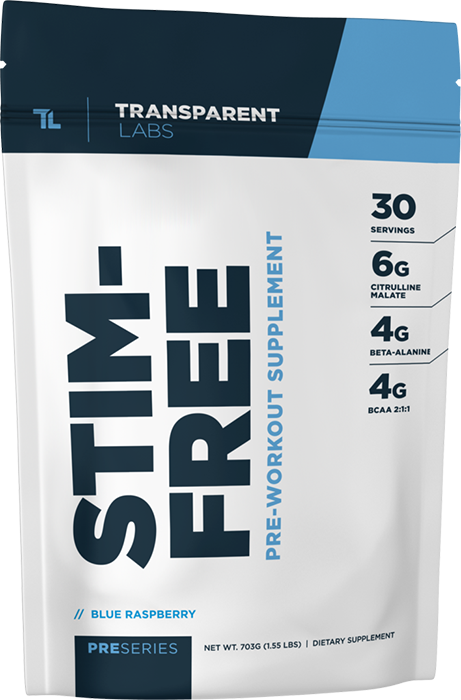 PreSeries STIM-FREE contains 60 mg of L-norvaline per serving. PreSeries STIM-FREE contains 5 mg of BioPerine per serving. Q: How should PreSeries STIM-FREE be taken to maximize its effectiveness? A: In terms of timing, we recommend taking PreSeries STIM-FREE 20-30 minutes prior to your workout. In terms of how much water to drink with PreSeries STIM-FREE, we recommend mixing 6-8 fl. oz of water with 1/2 scoop (to assess tolerance) and mixing 12-16 fl. oz of water with 1 full scoop. Q: I am subjected to drug testing for my sport, can I take PreSeries STIM-FREE? Q: What is the difference between PreSeries STIM-FREE, compared to PreSeries LEAN and PreSeries BULK? A: PreSeries STIM-FREE, as the name suggests, contains zero stimulants and has added Creatine HCl. PreSeries BULK is designed to support lean muscle growth and includes a testosterone support complex, while PreSeries LEAN is designed to support fat loss and includes a thyroid support complex. Q: I don't live in the United States, can I still buy PreSeries STIM-FREE?